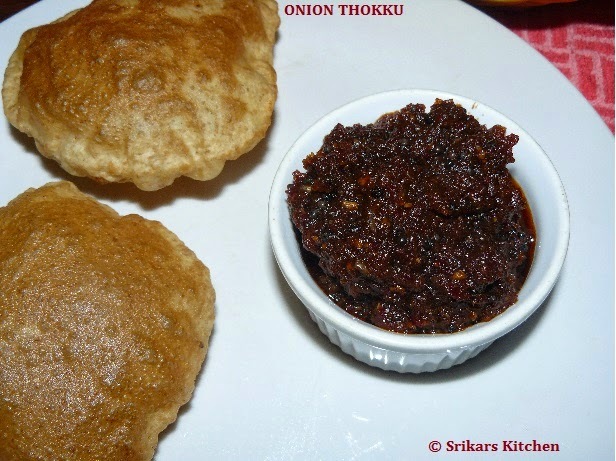 Onion thokku- My favourite thokku. It is an 'All in one' thokku. This is best side dish for Roti , poori, Dosa, Idly, Plain Rice,Curd rice,etc.It is easy to make & can be kept in the fridge for more than 10 days. Take a blender, add tamarind, red chillies ,garlic,salt & make a course paste. Add shallots & continue blending to make a fine paste. Add water If needed while blending. Heat oil in a pan, add mustard seed & allow to temper. Add ground paste & mix well. Cook until all raw flavours extracts & oil comes out. Serve with plain rice, roti, poori, paratha ,etc. Love the pickle with fluffy puri's ......... Yumm!